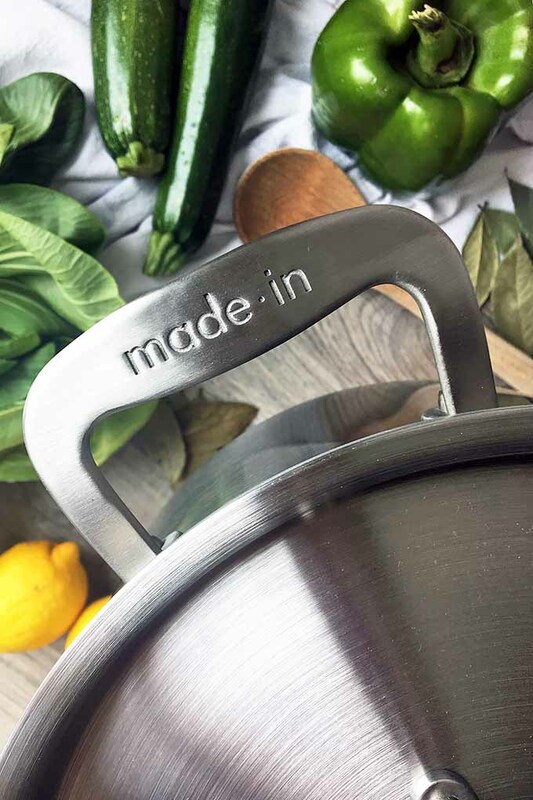 Made In Cookware is like the new kid on the block in the kitchen world. You can’t help but want to get to know the new kid. There’s something intriguing about someone so new. Someone who’s a little quirky, a little different, and perhaps even better than all the other kids you’ve known for awhile. The same can be said for the co-founders of the company, Chip and Jake. Especially if, between the two of them, there is a combined 150+ years of commercial cookware, e-commerce, and retail industry experience behind them! 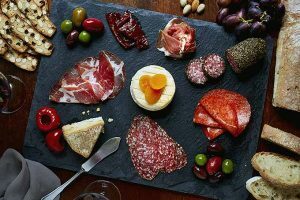 Launched in September 2017, Made In is a new line of all-American cooking essentials. Designed to be the “core of your kitchen,” it features all the basic and most fundamental pots and pans needed in any home, from a millennial couple moving into their first apartment together to an established family of five looking for a necessary upgrade in cooking equipment. In this review, we’ll first go over the background and philosophy of the company. Then, we’ll take a look at the overall design and construction of the equipment before reviewing the individual products and collections they currently sell. As one of their bestsellers, Made In’s Fry Pan is described as a “kitchen workhorse.” I couldn’t agree more! 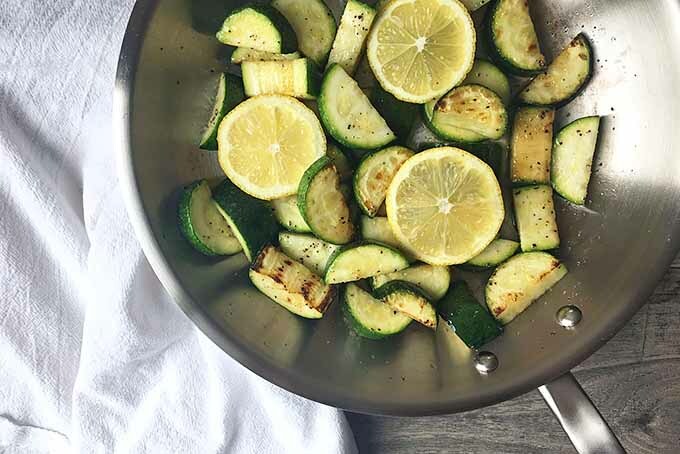 Use this all-purpose skillet for a variety of cooking methods, from searing meat to sauteing a medley of veggies. 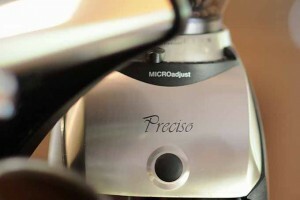 It is available in three sizes: The 8-inch has a 5-inch-diameter cooking surface. The 10-inch has a 7.5-inch-diameter cooking surface. 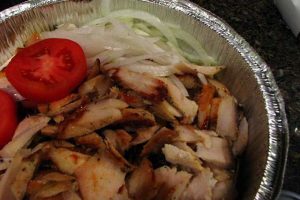 The 12-inch has a 9.5-inch-diameter cooking surface. 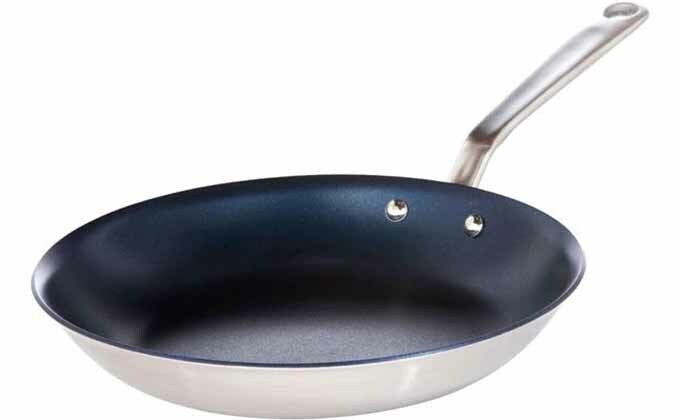 The PFOA-free Nonstick Fry Pan option is available to purchase in two different colors on the inside of the pan: a dark navy blue or dark gray. 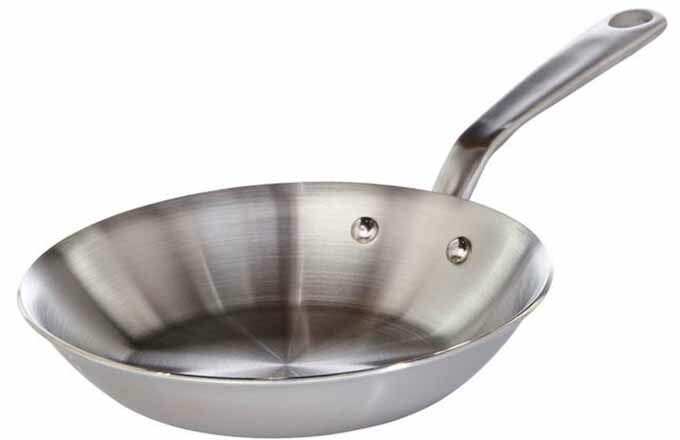 This is also available in the same three sizes as the traditional fry pan: 8-inch, 10-inch, and 12-inch. 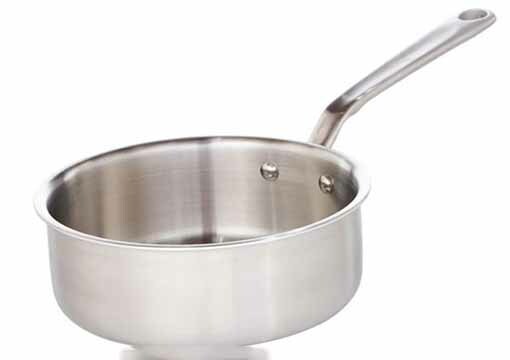 The company’s Saucepans are sleek and perfectly designed to not only make sauces, but also to boil, poach, and reheat liquids. There are two size options to purchase. 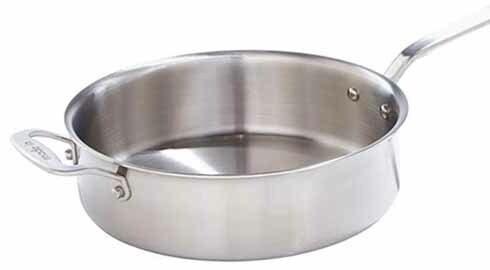 The 2-quart pan is 3 inches tall with a total length of 16.5 inches, and can hold up to 8 cups of liquid. The 4-quart option is 4 inches tall, also with a total length of 16.5 inches. It can hold 16 cups of liquid, or 8 servings of soup, as explained by the company. 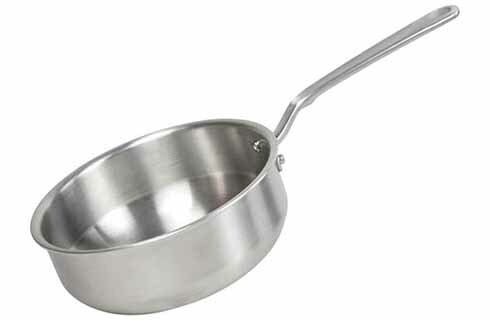 The Saucier is designed like a saucepan, with one major difference: it has edges that are rounded rather than forming a 90-degree angle between the base and the side walls. This helps to keep thicker sauces or cooked grains from getting stuck in the edges. The saucier is available only in the 3-quart size. 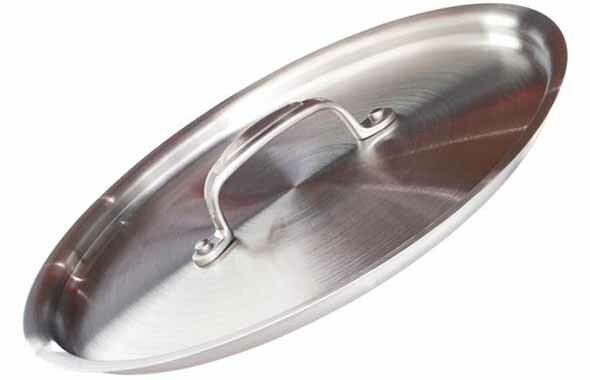 The Saute Pan has a very large cooking surface, 10 inches in diameter. 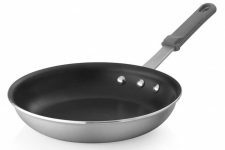 The larger surface area and high walls, compared to that of the fry pan and nonstick pan, are ideal for large roasts, or for holding all ingredients in a one-pan meal. 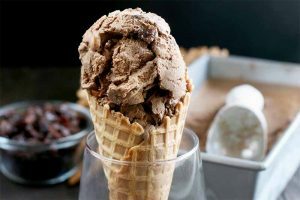 This is available in one 4-quart size to purchase. An essential in any kitchen, Made In Cookware’s Stockpots are big and durable. I love how strong and sturdy the handles feel – it so easy to carry heavier ingredients for stews and stocks, like the ones I made this past week! The stockpot is available in two sizes. 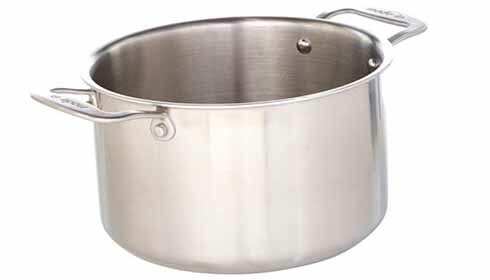 The 5-quart pot is 5.25 inches tall, with an 8.5-inch diameter, and measures 13 inches from handle to handle. According to the company, it’s perfect for smaller households. It’s exactly the size that I needed for living on my own. Big family? Cook in large quantities? The 8-quart option is what you need. It is 5.5 inches tall, with an 11-inch diameter, and measures 14.5 inches from handle to handle. While you can purchase all of the above pots and pans with lids, you can also buy your lids individually if needed. 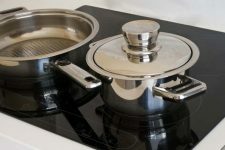 Lids are available in three sizes, and fit all the different pots and pans according to the appropriate size. The small lid fits the 2-quart saucepan. The medium lid fits the 3-quart saucier pan, the 4-quart saucepan, and the 5-quart stockpot. The large lid fits the 8-quart stock pot and the 4-quart saute pan. In addition to purchasing the individual pots and pans, you can order one of their kits – assorted combinations of the company’s products. 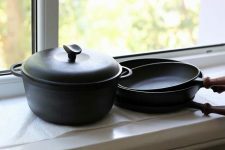 You can save money this way, and have a suitable arsenal of pot and pans that best fits your needs. You also have the convenient option of making monthly payments, rather than being charged the full price up front. Chip and Jake have been best buddies for years, growing up together since preschool. Jake’s family has been working in the cookware industry for over a century, designing and outfitting commercial kitchens and supplying restaurants, hotels, and casinos. Combined with Chip’s extensive background in the e-commerce industry, it’s no wonder they make such a dynamic duo of creative entrepreneurship! Chip and Jake founded Made In with the philosophy of creating and selling directly to consumers a line of simple, yet exceptionally crafted, cooking equipment that covers all the basic essentials needed in any home kitchen. 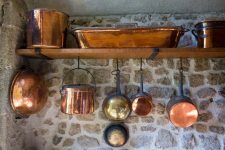 They wanted to create a superior line of pots and pans worth the investment – designed to last a lifetime of frying, searing, sauteing, boiling, braising, and much more. One of the main defining features of this company is its dedication to being a true American brand crafted by passionate, experienced manufacturers throughout the United States. 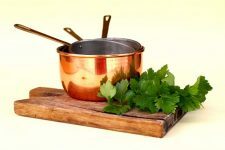 The materials used in each pot and pan are sourced here in the United States, like metals from Kentucky and Pennsylvania, and nonstick coating from Illinois. Not only is Made In committed to making superior products, they’re also devoted to a high standard of customer service. 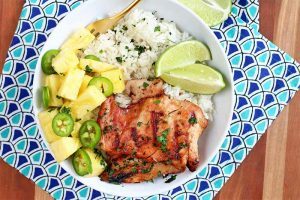 The company is small and family-owned, and ensures that its direct-to-consumer approach to selling, rather than the process of going through a separate store to sell their products, provides a more simple, more intimate, and more affordable option to the home cook. 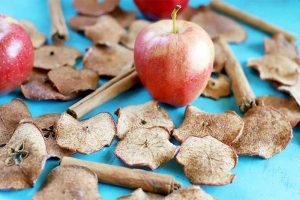 The company website is easy to navigate, with a fun blog filled with recipes, cooking tips, and ingredient knowledge. 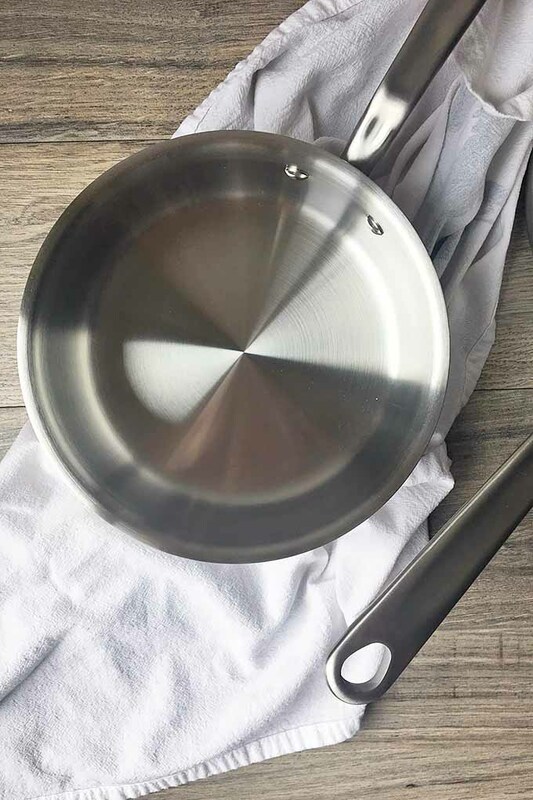 Each one of the company’s pots and pans is crafted with 5-ply construction, combining 5 layers of bonded stainless steel and aluminum. The two outer layers of stainless steel and the three inner layers of aluminum will help to evenly heat your food, without any annoying little hot spots. 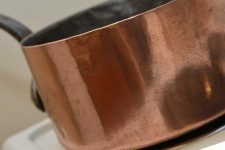 Whether you’re using a gas stove, electric stove, or a hot plate, Made In’s metal composition will uniformly conduct the heat throughout the pan’s surface. The pans feel durable and weighted, nothing flimsy here. You’ll see on the website that they use 18/10 stainless steel – the metal is made with 18% chromium and 10% nickel. 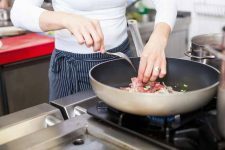 What does that mean for the hungry home cook? 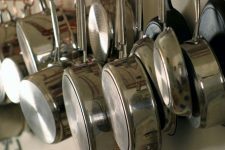 Chromium and nickel will help fight warping, corrosion, and rust, making these pots and pans last for years. Perfectly pan-seared chicken for life! I’ve never really paid too much attention to the handles on any of my pots and pans. At least for me, the handle has always been a bit of an afterthought. Shame on me for thinking that. 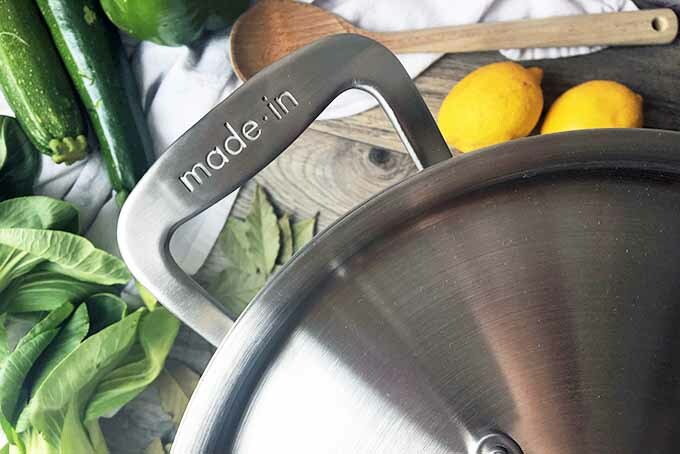 Made In has dedicated significant time and care to crafting a comfortable, multi-purpose handle. The area of the handle closest to the edge of the pan is thoughtfully designed to add a bit more control and strength when you hold it. Because some of the larger pans are pretty heavy (especially for someone like me, with small wrists!) the extra reinforcement is helpful, though I still struggled a little while lifting the heavier pans with one hand as I was cooking. The rest of the long handle is designed to be heat-resistant, staying cool while you’re cooking on a hot stovetop. 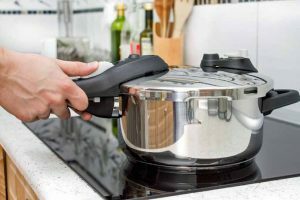 A word of caution: the part of the handle closest to the pan is not resistant to heat – Made In reminds users to be sure to grab closer to the middle or end of the handle when cooking. And that hole at the very end of the handle? Use it to hang your pots and pans when not in use! 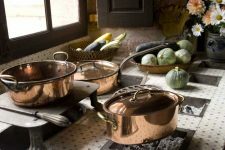 Because who wouldn’t want an entire wall that proudly displays a pretty and shiny collection of gorgeous metal cookware? 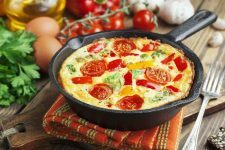 If you order the one nonstick pan option, you’ll be gifted with so many benefits. The surface is PFOA-free and is approved as safe by the FDA. 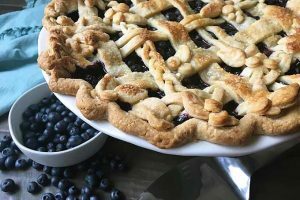 The pan is safe to use in an oven, as it can withstand temperatures up to 660°F before the nonstick coating starts to break down. Note: While the company claims that no sprays, oils, or other fats are needed to cook with it, I would still recommend brushing on just a thin layer of fat. With my first test of the clean nonstick surface, my fried eggs did stick to the pan slightly. All the pan needs is just a little fat to help. Afterwards, it was a breeze to fry, flip, and eat! 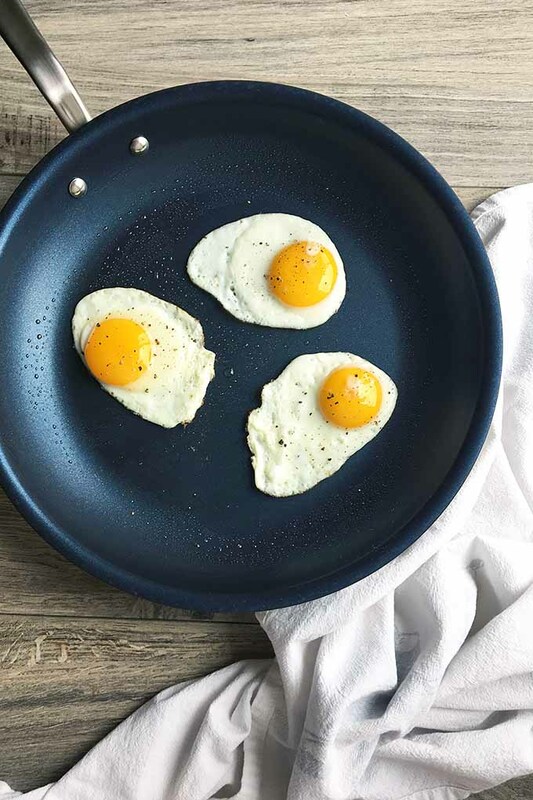 For more information on nonstick pans, and advice on how to properly clean and care for this particular style, read our article on choosing the best nonstick skillets for your home. 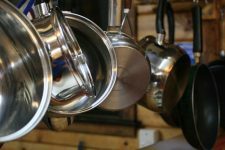 Cleaning these pots and pans is easy, and will help them stay in great condition for a significant amount of time – as long as you are gentle! 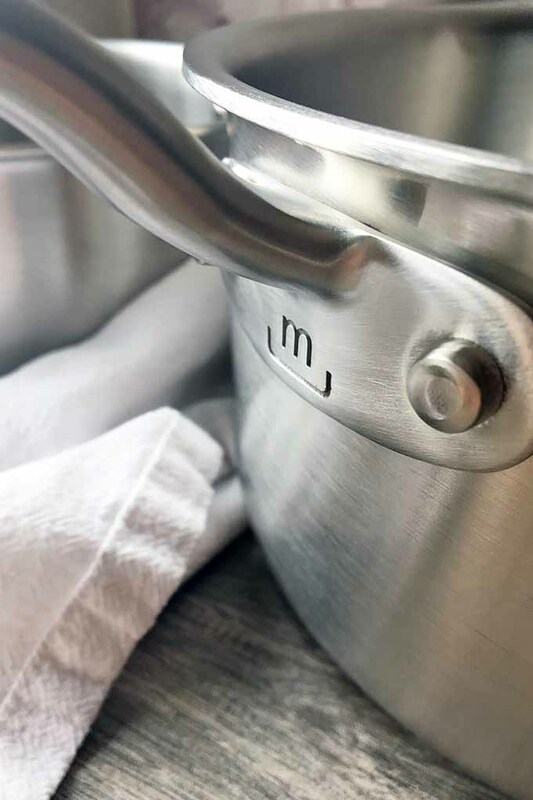 While all the pots and pans are dishwasher safe, the company highly recommends handwashing and drying immediately to ensure proper care and minimal damage. Avoid any abrasive materials like steel wool while cleaning to prevent any damage from scratching. Stick with a soft sponge for these guys. 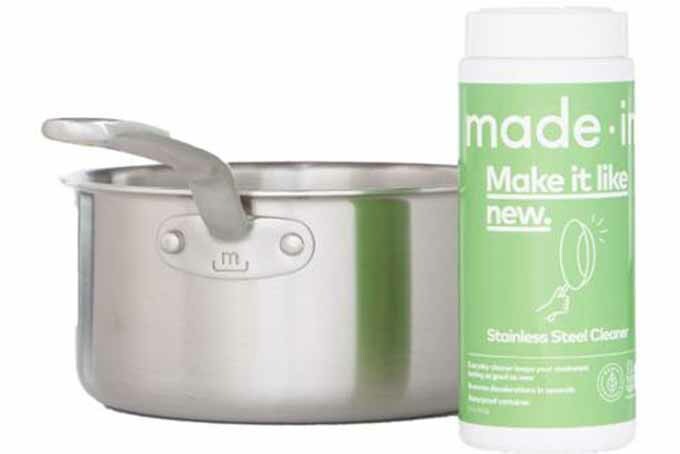 You can purchase Made In’s Stainless Steel Cleaning Solution for the stainless steel pots and pans, or simply choose to use a gentle dish soap. Dish soap and hot water is recommended for the nonstick skillet. Here’s another special feature to relieve the stress of finding space to store them: they’re all designed to stack on top of each other! All items have a lifetime warranty, and the company offers a risk-free, 100-day trial for new customers with any purchase. If you are unsatisfied with your purchase, contact customer service to get a full refund, with shipping paid for by the company. Was your product delivered damaged? How sad! With the right pictures and documentation, the company can file a claim with the carrier and get the item replaced at no charge. For additional purchases after your first, please know that the 100-day trial does not apply. However, the company will still honor free returns of unused items for 30 days after purchase and pay for return shipping. For more thorough information on their policy, be sure to read the warranty section listed at the bottom of their website. For me, it’s a fun fact to know the founders of Made In have been close companions since they were kids. Without getting too sappy… the dedication that they have shared in their friendship for years is clearly reflected in the principles of their family-owned company. They are committed to providing the best customer service, having strong partnerships with manufacturers, and selling high-quality products that will last a lifetime. Ah, who am I kidding? All of the sappy goodness! So, if you are looking for a company that is rooted in years of commitment, high standards, and an all-American vigor, definitely consider purchasing from Made In. Have some fun with the new kids on the block, and try their phenomenal new line of pots and pans. If you’ve already purchased and used this brand, or are thinking about it and have some more questions, feel free to leave me a comment below! Photo credit: Credited photos by Nikki Cervone, © Ask the Experts, LLC. ALL RIGHTS RESERVED. See our TOS for more details. 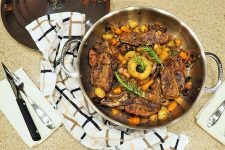 Product photos via Made In Cookware. Sample products provided by the manufacturer. Is there a lid to fit the 8” fry pan, and do I really want one? Thoughts?